I’m getting ready to do a bicycle trip on the Ohio to Erie Trail. 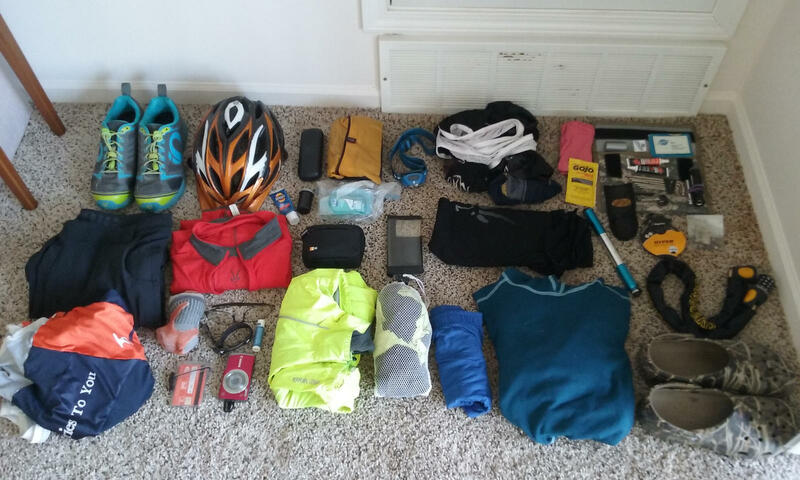 I’ll be riding from Cincinnati to Cleveland over five days. I’ll be staying in a motel one night, staying with relatives or friends two nights, and using contacts from Warm Showers another two nights. I won’t need any camping gear, so I’m packing pretty light. The weather is supposed to be pretty pleasant, so for clothing, I’m able to save a lot of space by choosing cycling clothing that can double as casual clothing, and vice-versa. I could have gone rack-less in true bikepacking style, but since most of my stuff fits in a trunk bag, I decided to use that. 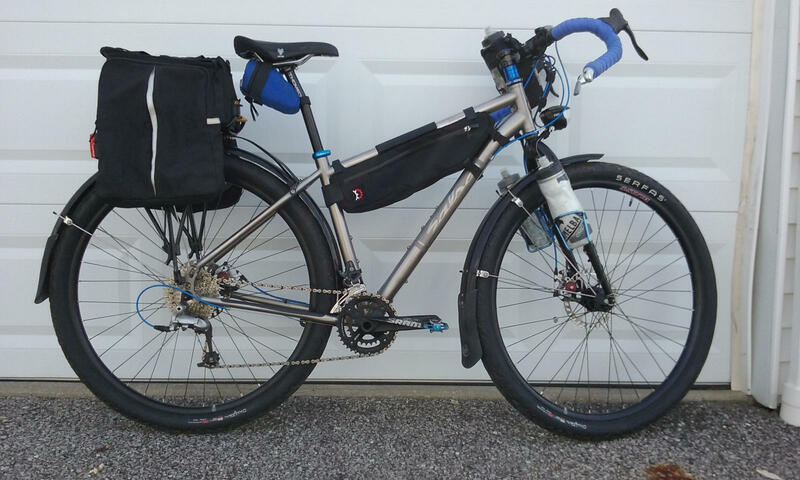 I have a Topeak MTX Explorer Tubular 29er Rear Disc rack. The Topeak bags work well with the rack to easily slide on and off, so I figured that would make it easy to take most of my stuff with me off the bike, should I feel that’s necessary. I’m using a small frame bag for a couple of extra items. I’ll be riding my Salsa Fargo bike. In addition to the Topeak rack, I have the Planet Bike Cascadia 29er fenders on it should the weather turn wet. I put two bottle cages on the fork mounts, plus a third bottle using the Revelate Designs Mountain Feedbag. I have a Schmidt SON28 front dynamo hub and a Busch & Muller Luxos U headlight, which has a USB port on the remote handlebar switch, so I’ll be able to use that to keep my phone charged throughout the riding days. I use a Planet Bike SuperFlash Turbo USB taillight.